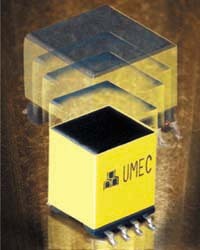 Using the company's patent-pending TKH7 ferrite core, UMEC Europe's TKH7 xDSL transformers measure 12.5 mm (0.4920) long 3 9.6 mm (0.3770) wide 3 12.3 mm (0.4840) high. The footprint is 50 percent less than standard EP13 and EP10 transformers. The shape of the TKH7 ferrite core is optimized for very low total harmonic distortion and low transformer parasitic elements to maximize transformer performance in xDSL applications.